Like most business owners, when someone asks the question, ‘So, how did you start your business?’ I love the opportunity to tell the story. For some people, starting a business is quick, like turning on a light switch. For some, it involves a story that starts long before the first customer appears. I had the chance to sit down with the first Anna’s Gourmet Goodies customer recently, the one who helped launch our business, in an unusual setting. 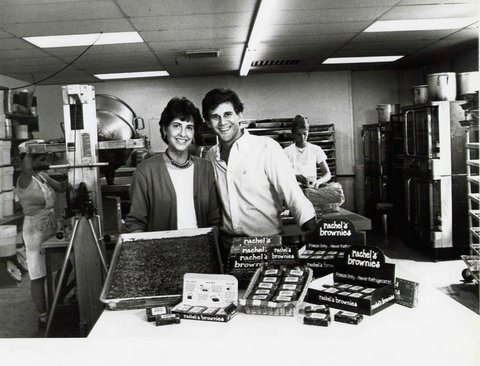 Our story starts with a cheesecake, not cookies, long before this first customer appeared. 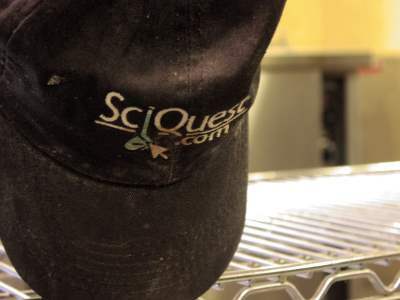 I was working at SciQuest during the ‘dotcom days’ of the late 90’s and early 2000’s. Work was fast paced, constantly changing and investor money flowed like water from a garden hose. We worked hard, played hard, and had fun with some interesting events. One of those was the ‘Cheesecake Bakeoff’. I had baked a few cheesecakes over the years, all based on my Mom’s recipe that I got from her over-stuffed box of food-stained index cards. 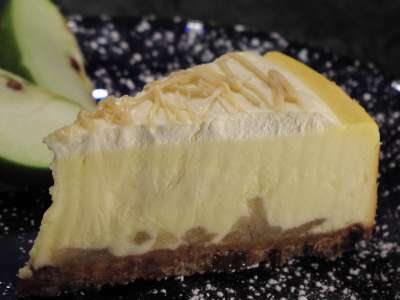 It was made with eggs sugar and cream cheese, but included a sour cream topping, lightly baked, adding a tang not found in traditional cheesecakes. The night before the contest, I made a last minute decision to enter. While I knew the recipe was good, I wanted top prize and figured I needed to kick things up a notch. I made a crust with graham crackers and finely chopped dates. I diced up some apples, sautéed them lightly in Kentucky Bourbon, and layered that on top of the crust. I poured in the cheesecake mixture, baked it and added the sour cream topping. Finally, I whipped up a bourbon caramel sauce and drizzled it on top. It looked great and I felt the addition of a little alcohol might give me an edge. As it turns out, I was right. My Apple Bourbon Cheesecake was crowned Grand Champion. I was awarded bragging rights and a baseball cap that I still have to this day. After winning, the recipe stayed dormant, for awhile. Months passed and after repeated encouragement to sell the cheesecake, I finally decided to see what it would take to bake and sell them. I contacted the NC Department of Agriculture and the Town of Wake Forest, secured permits and inspections, and we were set to start baking. But first, we needed the most important ingredient, a customer. I had been eating lunch at a small café in Cary called Chef John’s. As a somewhat regular patron, I got to know the owner, Chef John, and decided to ask him if he would give the cheesecake a try. He agreed. I rounded up packaging from a local store, baked one cheesecake and dropped it by the restaurant. I checked back with Chef John after a few days and he said people ‘Loved it!’. So we made another. Then another. Then another. From that one customer, we grew the business organically, adding new cheesecakes and eventually pies, finding customers who were willing to pay for our products to finance the growth. It grew until we decided in 2003 to take a leap of faith and build Anna’s Gourmet Goodies full time. We continued to grow our customer base and Chef John was a customer even after he closed the café and focused strictly on catering. But his business and his career, ended in January 2011 when he was arrested and charged with murder for the death of his wife. Both Debbie and I made deliveries and got to know his wife Donna as well as Chef John. The news story was a shock to both of us. He was tried, convicted, and sentenced to life in prison. It was the first time I was this close to someone convicted of this type of crime. It wasn’t something I’d ever connect with Anna’s Gourmet Goodies and our customers. I thought about him off and on over the years, but it wasn’t until my neighbor interviewed me for his research project on hiring offenders that I began thinking of visiting Chef John. Keith is a retired Federal prison warden and was completing his PhD. “It was never my job to judge whether or not anyone was right or wrong”, he said. “I just did my job”. It took awhile, but at some point I felt compelled to track down Chef John, reach out, reconnect and thank him for what he did that was good, help me start Anna’s Gourmet Goodies. 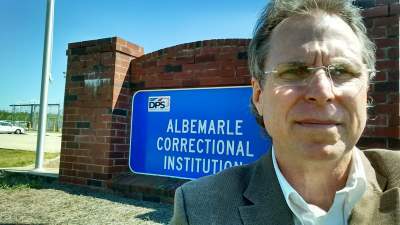 With Keith’s help, I looked him up in the North Carolina prison directory and found he had been transferred to the Albemarle Correctional Institute. After calling, sending him a letter and completing the necessary forms to apply for a visit, I scheduled a trip to visit him on a Sunday afternoon. It was my first visit inside a Federal Prison and not at all like what I’ve seen in the movies. The guards were firm, but friendly and the grounds were immaculate. After passing through security, I was sent to a large open room with tables and chairs to wait. A few minutes later, Chef John came out. He had a big grin on his face, gave me a warm welcome and immediately asked about our cheesecakes and his favorite, our Key Lime Pie. We sat down and started catching up. If not for the surroundings, we might as well have been sitting back at the Café talking about old times. I shared news about our business and how we had changed to only making cookies and brownies. I updated him on my family, as Anna was in a car seat when we first started deliveries to the Café. I asked about his life in prison and he filled me in on some of the details of his life behind bars. We did not talk about the details of the event that led him there. That’s not why I came. My visit was not about judgment, but gratitude and closure. I try very hard to tie the threads of my stories back to Anna’s Gourmet Goodies in a way that makes sense and provides you, the reader, with some measure of value. To give you food for thought that might inspire you to action in your life and/or business. And, to help our customers, both current and future, better understand the ingredients that make up our business beyond butter, flour, sugar and eggs. This one, has been more than a little difficult, but no less important. For me, it was a chance to say thank you to someone who, despite his current circumstance, helped me along my journey. In turn, I had the opportunity to help Chef John remember back to an earlier time and smile, if even for a brief moment. As I’ve written before, that’s fundamentally what we do at Anna’s Gourmet Goodies – create memories and hopefully generate a smile or two. Since the prison system would not allow me to do that with a cookie or a slice of pie, I used my words, a smile and a handshake. All of which make up a winning recipe for a brief moment of happiness, no matter how you slice it. No, I’m not referring to the kind of sticky that comes from putting your hand in the honey jar. I’m thinking about sticky as it relates to memory, something that stays there for a long time. Anna and I watched the Disney movie ‘Inside Out’ (worth seeing if you have not) and it was an interesting take on what happens to our thoughts and memories. It was funny, well done as most Pixar movies are and got me thinking about what we do at Anna’s Gourmet Goodies. 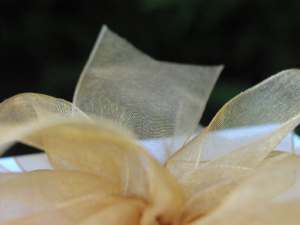 We often describe our gifts as ‘leaving a lasting impression long after the last crumb is gone’. I also received a phone call recently from a former customer because we created a memory for her. One of her employers used to send our cookies as gifts to their employees. She decided to start sending gifts to her clients and called us because of that memory. 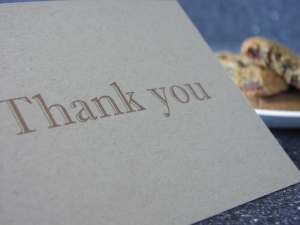 A simple ‘thank you’ can mean a lot – especially pared with a gift of our gourmet cookies. One of the first things she said was how she remembered getting our cookies on her birthday and work anniversary, a simple ‘thank you’ gift from her company letting her know she was valued and appreciated. This was years ago and I’m wondering, of all the things the HR department did, how many of them stood out like the simple gesture of remembering employees with a box of cookies on their birthday and work anniversary? “I see a widespread assumption among managers that the main way to improve productivity is to set tough goals and push people. Yet we’re learning that employees who feel appreciated are more productive and loyal. An on-the-job study of 41 university fundraisers, all of whom were working on fixed salaries, confirmed this. For half of the group, the development director visited them in person to say, “I am very grateful for your hard work. We sincerely appreciate your contributions to the university.” The other half of the group received no extra expression of thanks. Thinking about the movie, Jim’s quote, our business, and my own life, I believe two factors make a particular event or experience memorable: the unexpected and emotional connections. It happens to all of us. We get caught up in the routine of life and business. But then, when something unexpected happens, either good or bad, we stop for a minute and that’s when the memory kicks in – like when someone gives us a real, sincere, ‘thank you’, that is totally unexpected. Another powerful memory generator happens when we make an emotional connection. When I smell strawberries, I think of Mom’s strawberry cake she always made on my birthday. When I say the words ‘my daughter’ I am transported back to that dimly lit room where she came into the world and I saw her for the first time. Both evoke emotions tied to permanent memories. Do you have memories from emotional triggers? I bet you do. While I’m flattered when people refer to me as ‘the cookie man’, (this happened just the other day at a Raleigh Chamber luncheon), I smile knowing that we are really in the business of creating ‘sticky memories’. When someone opens the package and bites into a cookie or brownie, I’d like to think two things happen. First, they are pleasantly surprised. And second, they are transported back to a time in their youth when they sat around a plate of cookies their Mom or someone special just made. I have no way of confirming exactly how many of the tens of thousands of packages we’ve sent out over the years created an experience that ended up tucked away somewhere in the memory banks of the person who opened the box and tasted our cookies and brownies. But I can say with certainty that it did for the customer who called us recently, and probably a few more. Sticky memories. For a company in the business of creating memorable experiences, that’s a pretty sweet reward. One of the interesting things about starting a new business is that no matter what road you start down, there will always be twists and turns that take you in directions you could never have predicted. For Anna’s Gourmet Goodies, one of those turns started out in Celebration, Florida at the National Pie Championships and carried us to the National Theater Workshop for the Handicapped in SoHo, Manhattan. 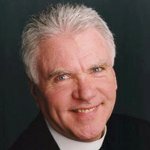 That meeting and conversation with Brother Rick Curry, S.J. had a lasting impact on the business and my life. 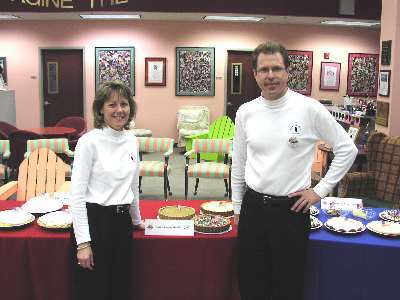 We competed in the 2003 National Pie Championships in Celebration, FL. In 2003, we joined the American Pie Council and planned our trip to the National Pie Competition in Celebration, Florida. We settled on three entries, Pumpkin Cream with Grand Marnier, Chocolate Kahlua Cream, and Real Key Lime. All made with our signature graham cracker and whole wheat pastry crust in a fluted pan. Our story, combined with original and unique recipes were sure to secure an award and a spot in the pie maker history books. But alas, despite our best efforts, we left without a single prize. We managed to get a very brief appearance in the Food Network’s coverage of the event, but that was the extent of our fame for the weekend. On the ride home, Debbie was thumbing through a copy of Oprah magazine and came across an article about a bakery run by a Jesuit brother. He used the proceeds to fund the National Theater Workshop for the Handicapped. It was a great story. 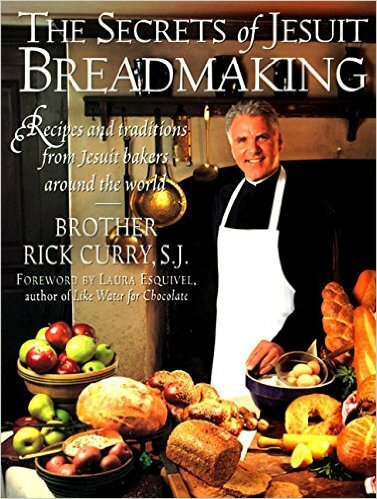 A Jesuit Brother, actor, author and master baker, pursing his passion, refusing to give up and helping others in a similar situation pursue their dreams. The challenges of running a non-profit and a business did not stop Rick Curry, despite the fact that he was born with only one arm. I decided to reach out to Brother Curry and ask if he would meet with me. I had a business trip planned to NYC in the coming weeks and it seemed like the perfect opportunity. Thankfully, he agreed. There are some people you meet in life where you feel an instant connection. Like being wrapped in a warm blanket with a cup of hot cocoa next to a crackling fire. That’s what it felt like sitting down with Brother Curry. We exchanged stories about our lives growing up. He told me how he ended up where he was, doing the work he was doing. Through all the twists and turns, it was clear that he was on the right path. Brother Curry was generous with his time that day. After laughing and exchanging more stories about life and baking, it was time for me to go. He picked up a copy of his book, The Secrets of Jesuit Breadmaking and signed it for me, “To Chris, someone who will make a big difference through baking.” He gave me a big hug and I was on my way back to North Carolina with more to think about and another signpost to add to my collection on this journey. Since then, I’ve referred to Brother Curry’s book on many occasions. I’m particularly fond of the Challa and Brother Bandera’s Italian bread, something I’ve made almost every Christmas for the past several years. This weekend, Anna and I picked out a new recipe from the book, Sister Courtney’s Buttermilk Bread. 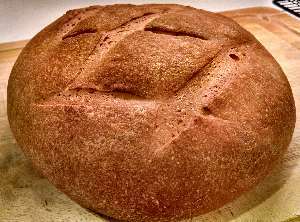 I modified it a bit, substituting olive oil for the shortening and baking rounds instead of loaves. It was wonderful. Light, soft, perfect with olive oil and homemade lasagna. If you’re interested, pick up a copy of his book at your local bookstore or online. Despite my best intentions I have not connected with Brother Curry since that chance meeting, but I’ve never forgotten his wisdom and strive to focus on what matters most at Anna’s Gourmet Goodies. I’ve looked him up a time or two online, but just never made it happen. I did another search and found that sadly, I missed the opportunity. He passed away on December 21, 2015 from heart failure. It was a brief meeting, but an important milestone in our business and my life’s journey. It’s rare to meet someone with a heart and a smile as big as Brother Curry. I’m still in awe of how much he accomplished and I have kept my promise not to let go of our original ingredient list. And if by chance Brother Curry is looking down on me from his Heavenly home I’d like to say thanks again for helping me along the way. You were definitely an important stop on the road worth traveling. I shared the ‘Starfish Story’ in an earlier post and I was touched by the number of people who reached out to let me know how much they enjoyed the story. It’s about making a difference, one act at a time. It’s pretty easy these days to take a look around your neighborhood or the world and be overwhelmed by the number of people in need. Instead of throwing in the towel, I remind myself that one gesture matters. At Anna’s Gourmet Goodies, we regularly receive requests for donations for a range of organizations, especially during this time of year. Some we’ve supported in the past, and some find us through Internet search. And while we simply can’t say yes to every request, it is something we genuinely enjoy doing. October was Breast Cancer Awareness month for 2015. In the US, about 1 in 8 women will develop invasive breast cancer over the course of her lifetime. (Let that sink in for a minute…) With numbers that high, it is not surprising to see so many organizations working to take on this insidious disease. While that can be a good thing, the shear magnitude of the problem can be a little overwhelming. This year nearly a quarter of a million women will be diagnosed with invasive breast cancer. We’re fortunate to have an organization in our area focused on making a difference for some of these women, one at a time. 1in9 is an organization whose ultimate goal is to ease some of the burdens that come along with the diagnosis of breast cancer. These might be emotional‚ physical or financial. They seek to make sure that women who find themselves to be the one in nine (or eight) don’t make that journey alone. On November 14, 2015, they’ll be holding their annual fundraiser, A Pink Tie Affair at the Masquerade Ball. We’ll be providing cookies for the sponsor and guest tables along with items for their auction. Specifically, donors will have the chance to bid on certificates to send a gift from Anna’s Gourmet Goodies as a part of the initial care package women accepted into 1in9 receive. If giving back is something you’ve incorporated into your business and/or your life, congrats and keep on keepin’ on. If not, I’d encourage you to find the one starfish you can help with your time, talents and/or treasure. Turns out my Mom’s advice was once again, spot on. It’s not gift, but the thought that counts. There’s one more reason why I’m giving back to 1in9 this year. Last October my wife Debbie received a phone call from the radiology group asking her to come back for a second mammogram. She was not nearly as worried as I was, writing it off as one of those things that happens sometimes. After the second mammogram, the doctor went back thru all her records for the past 10 years and determined that indeed, something showed up that did not look right. They wanted to go in and do a biopsy. The few hours we spent in the doctor’s office that day went by in slow motion, each minute felt like a day. It was obvious that the staff at the reception desk had experience and training managing anxious husbands. Maybe the cookie samples helped a little. I can’t say for sure. The next few days waiting for the results felt like years. It all happened so fast, but seemed to take forever. The procedure was on a Friday and I’m certain it was the longest weekend of my life. Finally we got the call to come in for the results. When the doctor opened the door to the room and came in, I could see from the smile on her face that we were indeed blessed that Debbie was not going to be one of the nine women on this day. This year it’s estimated that nearly a quarter of a million women will not be as lucky as Debbie. 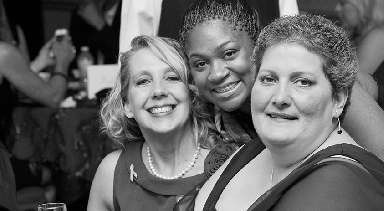 They’ll be diagnosed with invasive breast cancer and begin a new chapter in their life. And for at least a few of those women, we’ll have the honor of sending a small package, filled with cookies and love that hopefully, will make the first few steps of this walk just a little bit easier, and not quite so lonely. P.S. If you don’t have an organization like 1in9 in your community and are moved to help in some way, learn more by visiting their website 1in9.com. If you spend any time at all around people in the food business, you’ll understand they share two common traits; a passion for what they do and a love for connecting to others who share that passion. The road we’ve taken at Anna’s Gourmet Goodies is full of people we’ve met along the way who’ve helped us, shared their knowledge and cheered us on. In turn, we’ve had the opportunity to do the same for others we’ve met. One of those opportunities to cheer someone on is my connection to Fanny Slater that began more than a dozen years ago when I first met her Dad, Jeff. I was introduced to Jeff through a contact at my last employer who met him at his previous employer, GoodMark Foods. GoodMark purchased Jeff and his wife’s company in 1989. Ra El started Rachel’s Brownies back in 1975. Jeff joined her in 1978 and together they grew the company to a nationally recognized brand. They appeared on TV shows such as The Phil Donahue Show and Charlie Rose, were featured in The New York Times and USA Today, and were even invited to the White House to have lunch with President Ronald Regan. But the business wasn’t born out of a desire to build a brownie empire. It was born out of a passion for chocolate and a desire to share that with the world. It just so happens that they made incredible brownies. Jeff and I shared several conversations about what was then our wholesale dessert business. He was generous with his experience and we kicked around ideas for collaboration. At one point, he invited us down to Wilmington to have dinner with his family while they were vacationing. His daughters, Fanny and Sarah served as babysitters for the day, playing with Anna on the beach while the adults talked about life and business. While we never launched a formal partnership, we’ve stayed in touch over the years. I recently reached out to get advice on a new idea I was working on and once again, Jeff was helpful in sharing his perspective and wisdom. I follow him on his blog, The Marketing Sage, and when I heard about Fanny and the Rachael Ray Cookbook Competition, I was excited to watch her pursing her passion for food and for the opportunity to cheer her on. Encouraged by her Grandmother, and of course her parents, Fanny entered Rachael Ray’s Great American Cookbook Competition along with nearly 1,000 other hopefuls. She made it from the top 20, to the top 10, to the top 5 which came with a phone call from Rachael herself and an invitation to compete for the grand prize of a cookbook contract on The Rachael Ray Show. Not only would the finalists cook in front of Rachael Ray, but some of the world’s most renowned chefs including Jacque Pepin – a foodie’s dream come true for sure. I watched Fanny on several of the episodes and while I am a bit partial due to my connection, I can tell you that her authenticity and passion for food came through like a beacon. It was not just about winning the contest, but about sharing her stories about food and family with the world. It was about pouring out her passion and making connections to others who share that same love of food and family. 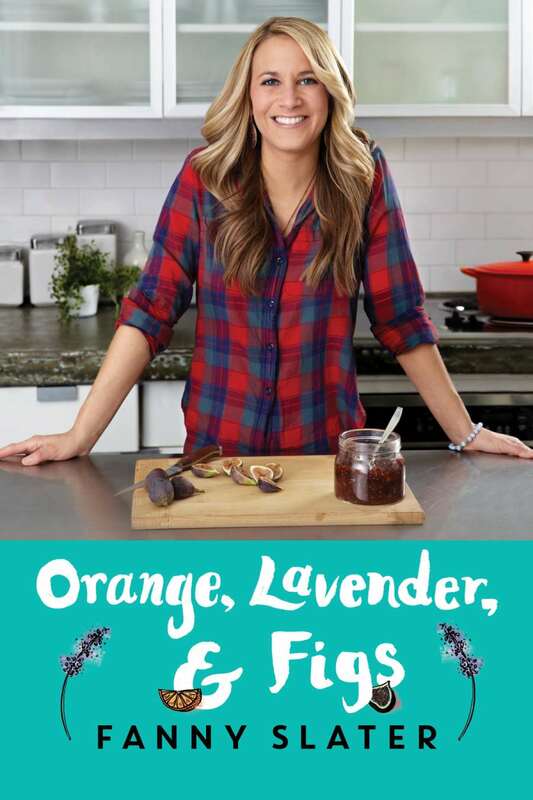 You can follow along and read more about her story on her blog at FannySlater.com Her cookbook Orange, Lavender & Figs is now available for pre-order on Amazon and due out on March 1st, 2016, so be sure and stay tuned. Recently, Fanny agreed to sample some of our goodies and put together a video about her experience trying our products. I must admit that it was a little intimidating to send brownies to the daughter of the creator of a national brand. But I know that whether or not we come close to her Mom’s recipe, I’m confident that we share some of the same measures of passion in our recipe. 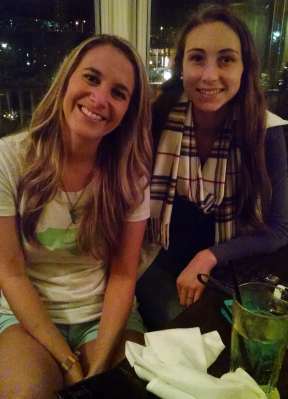 Anna and I ventured down to Wilmington to share a meal with Fanny and re-connect after all these years. 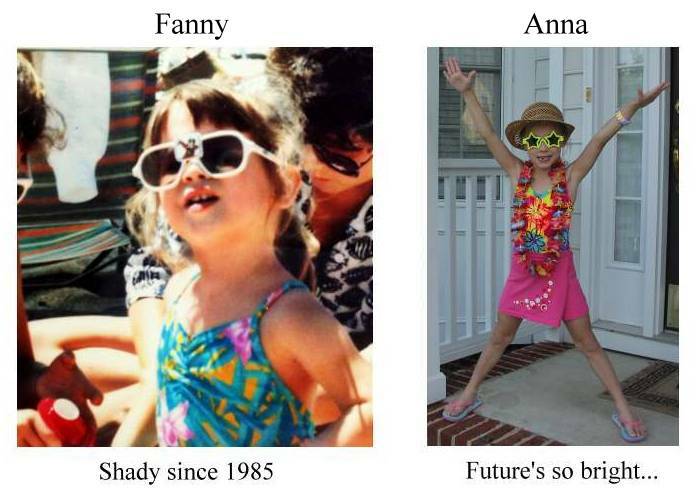 The last time they met, Fanny was about Anna’s age and Anna was the girl in the sunglasses, running and playing in the sand. It is such a thrill to watch these two young women, one in the middle of living her dream and the other on the verge of venturing out to find her way in the world. There are a lot of reasons why we started Anna’s Gourmet Goodies back in 2001. Of course we strive to be a profitable company and good stewards of what we’ve been given. But the real reason comes back to passion and time for family. Our cookies and brownies are memorable gifts to anyone who has ever received a package from us, but the real gift for me has been the opportunity to build a business based on a passion to make others happy. Along with that, I’ve had the opportunity to spend time as a family and watch Anna on her journey, helping her find her passion, just as Fanny has done with hers. We’re on track to having our best year ever at Anna’s Gourmet Goodies as connections to customers who believe what we believe has grown at a pace that continues to make us smile. Our passion for creating a memorable experience continues unabated. As we head into the busy season, we’ll be busier than ever keeping up with orders, making sure that everything arrives just as expected, while welcoming new customers into the family. We’ll also keep our focus on nurturing those family and foodie connections, cheering on Fanny and Anna as they pursue their passions. It’s what foodies do. After all, passion and connections are two of the most important ingredients in any recipe for a successful business and a wonderful life. Go Anna! Go Fanny!